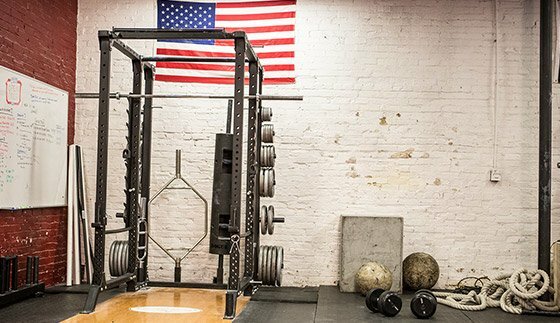 You can train for strongman in a commercial gym! Here's how to do it. When I fell in love with the sport of strongman, I had a conundrum on my hands: How was I going to train for this sport without access to the right equipment? That was roughly a decade ago, and to this day, I still don't own any strongman equipment. Nor do I train at a fully-loaded strongman training facility. Instead, the vast majority of my training is done in gyms that are not tailored to my sport. I make this work because the most important thing in strongman is to be really strong, and strength can be attained through barbell work in any gym. As a matter of fact, I actually gave up on pursuing strongman when I moved overseas in 2009, but because I never stopped building my strength, I returned to competition in 2013 at the top of my game! Even if you're not planning to compete, strongman training can still increase your work capacity, help you burn fat, and increase your athleticism. Not only that, but it's a great way to add fun and variety to your regular routine! Please note that if you want to compete in the sport, it's imperative that you seek out a strongman gym or training group near you so you can practice with the actual implements at least a handful of times before competing. It's totally possible to enter a contest without ever having touched strongman equipment. I've witnessed this firsthand. But you'll be much more confident—not to mention safer—if you get some hands-on experience before your first contest. With that in mind, let's tackle the basics of how to train like a strongman without regular access to sport-specific implements. 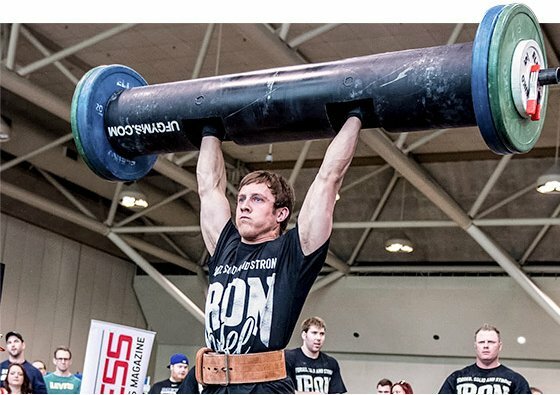 "Please note that if you want to compete in the sport, it's imperative that you seek out a strongman gym or training group near you so you can practice with the actual implements at least a handful of times before competing." For strength sports such as powerlifting or Olympic-style weightlifting, the goal is to be good at specific lifts. To be successful at strongman, however, you must train your primary strength builders in a variety of ways, because there are many different events. 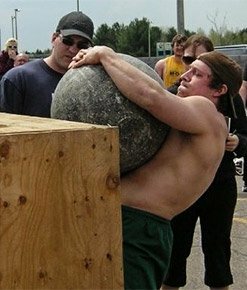 You can train for these unique strongman events with equipment you can find in most commercial gyms. Here are the main strongman lifts and how you can tailor your workouts to build strength and train sport-specific movements at the same time. In a real strongman competition, you have to pick up a heavy stone off the ground and pop in onto a platform or over a bar. You'll get the most carry-over from straight-legged deadlifts, seated good mornings, hang cleans, and front or Zercher squats. As you can probably guess from the name, this event requires you to flip a super-heavy tractor tire over and over. The deadlift will have the most carry-over for this event, but you'll definitely gain benefit from hang cleans and incline presses as well. Strong, healthy biceps are also important for this event, so add hammer curls to your exercise arsenal. It's a shame gyms don't have more access to car-deadlift rigs, but, hey, you do what you can. Clearly, deadlifting with both a straight bar and trap bar will most closely mimic this strongman staple. In a competition, you must pick up odd objects like the log, axle, and circus dumbbell from the ground and press them overhead. To train the bottom portion of this event, I suggest deadlifts, stiff-legged deadlifts, cleans, and hang cleans. The press portion will have the most carry-over from the front squat, push-press, incline press, and single-arm dumbbell press. "In a competition, you must pick up odd objects like the log, axle, and circus dumbbell from the ground and press them overhead." The super yoke is event in which you must walk with a really heavy bar on your back. It almost looks like you're carrying an entire squat rack. Heavy back squats aren't a bad choice here, but front squats are the ultimate exercise to build the core strength you need to excel at this event. Big traps are also a plus here, so heavy deadlifts, once again, have great carry-over. To do this event, you pick up two extremely heavy suitcases and take them for a walk. You'll get direct carry-over from deadlifts, specifically trap bar deadlifts. You can also use heavy dumbbells in the gym to mimic this movement almost exactly. Object-carry events require you to pick up something off the ground—a sandbag, a keg, a stone, or another kind of awkward object—and carry it a considerable distance. As you've probably already figured out, the deadlift variations will be key for the pick-up, and front squats or Zercher squats will have the most carry-over for the carry. Strong biceps are also paramount for carries, so don't neglect those guns! Grip strength is one of the most important aspects of competing in strongman. If you have a weak grip, you won't get very far, so it's important to challenge your grip as often as possible. I don't like altering my main strength-building exercises in order to challenge my grip. Doing that just defeats the strength-building purpose of the lifts. Instead, I use my accessory movements to work my grip. Pick up a pair of Fat Gripz to carry with you at the gym to use on your last exercises. These little rubber cylinders can be placed on any regular bar, handle, or dumbbell to challenge your grip and simulate the use of a fat bar or axle. The best rule of thumb is to use Fat Gripz for every accessory exercise unless the implement handle spins on its own. The sport of strongman is getting more popular around the world. And for good reason! Here's everything you need to know about the sport, and how to get involved. Dain has been in sports all his life and loves strength training. He is a Certified Strength and Conditioning Specialist, powerlifter and strongman.